The south east section of the Suburban Rail Loop will run underground between Cheltenham and Box Hill. Photo: Rail Projects Victoria. Bold plans for an underground rail network circling the suburbs of Melbourne have been unveiled by the Government of Victoria in Australia. The megaproject will connect every major train line from the Frankston line all the way to the Werribee line through Melbourne Airport, with up to 12 new underground stations. Such is the size of the ‘Suburban Rail Loop’ that planners have described it as “the biggest transformation of public transport in Australian history”. Should the Labor government be re-elected in November, it will stump up A$300 million for a full business case, design, and pre-construction works, with work on the first section in Melbourne’s south east expected to begin by the end of 2022. Plans for the multibillion-dollar rail project, which will require state, Commonwealth and private sector contributions, come a month after the Labor government announced up to A$5 billion for the Melbourne Airport Rail Link should it be re-elected. In response, Victoria’s Liberal Party, the Labor government’s official opposition, said it supports new rail infrastructure but called for the project to be sent to Infrastructure Victoria for proper assessment, costing and planning. “At the moment, the Andrews Labor Government can’t say how much it will cost, how it will be funded or when it will be finished,” a spokesperson said. Construction of the entire project will take multiple decades, but the first sections could be completed in 10 years. The state capital’s 100-year-old radial transport network can’t keep up with a rapidly growing Victoria, according to the government, which says without action the network will “grind our state to a halt”. Congestion will be slashed, thousands of passengers will be taken off existing lines and 200,000 cars will be removed from major roads, it adds. A map of the rough alignment of the Suburban Rail Loop. Photo: Rail Projects Victoria. Estimates predict the Suburban Rail Loop will become the busiest rail line in Victoria by 2051. Exact station locations, route alignment, rolling stock, and staging will be confirmed through the full business case and technical work. Early planning and feasibility work, including identification of the project corridor, was undertaken by Development Victoria, PricewaterhouseCoopers and the Office of the Coordinator General over the past year. 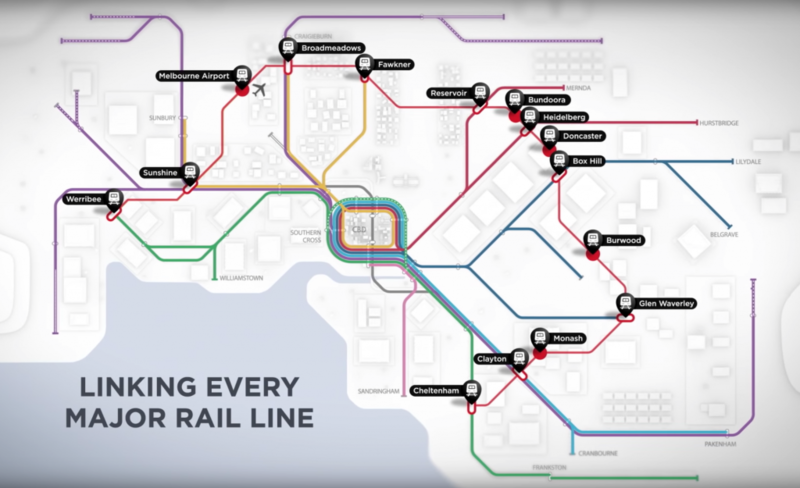 Victoria transport minister Jacinta Allan said: “The Suburban Rail Loop is the underground train system a growing Melbourne and Victoria needs – connecting every Victorian to jobs, education, hospitals and shopping without needing to change trains in the CBD. More than 20,000 jobs are expected to be created during construction, including 2,000 apprentices and trainees. What route will the Suburban Rail Loop take? The south east section will run underground between Cheltenham and Box Hill – with new rail tunnels linking the Frankston, Cranbourne-Pakenham, Glen Waverley and Belgrave-Lilydale lines. 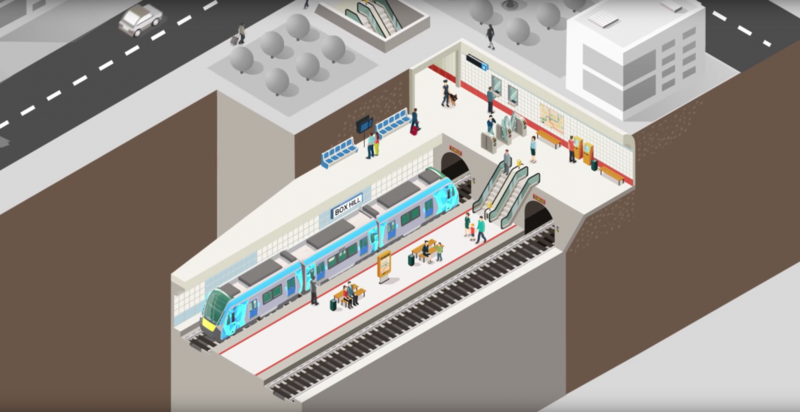 This section could include six new underground stations – four underground interchanges with existing lines, and two potential new stations at the Monash Clayton and Deakin Burwood precincts. The north east section will connect the Belgrave Lilydale line to the Hurstbridge, Mernda, Upfield and Craigieburn lines before heading to Melbourne Airport. In addition to the four interchange stations on these lines, there will be potential new underground stations in Doncaster and the La Trobe precinct in Bundoora. The new Airport Rail Link will form the north-west section, with construction also underway from 2022. The western section will connect to the Werribee line via the new Sunshine super-hub, with further technical investigations to determine the scope and route of this section. The loop will have no level crossings and no interaction with the existing network.